We have been witnessing in North London since early last year. 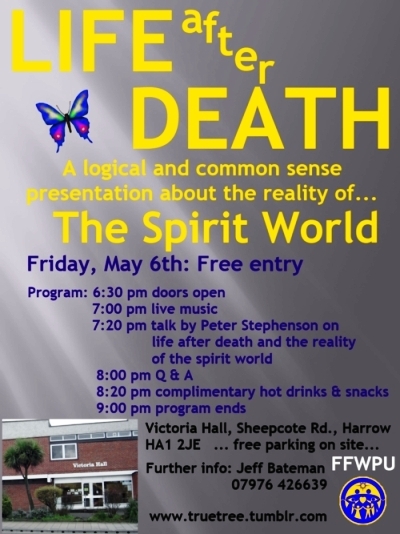 Initially we contacted quite a few people who responded to invitations to hear about the Spirit World and Life After death. Looking back over the last 9 months or so we have taught at least introduction to over 30 people which is probably more than we did in the previous 4 years here. We have had two 2 days workshops locally taught by both William Haines and Ed Stacy from the West Country. Each week Principle is taught at the home of Andrew and Marie Derricutt on both Tuesday nights for advanced lectures from William Haines and on Thursdays with Taeko Duckworth. We have now Expanded this with Taeko also teaching introduction in The Hayashi home on a Tuesday evening. Beyond the actual activity it is a chance to come together 2-3 times a week to both hear principle and discuss our witnessing as well as go out together on a Sunday. To liven things up a little more we will be having a special event on 6th May at Victoria Hall you can read about it here truetree.tumblr.com/ Organized by Peter Stephenson and Andrew Derricutt. You can also read about North London Witnessing from another perspective in this next issue of Today's World. One of our guests, Devi Proposed that we start celebrating each others birthdays. She cooks and also buys presents for those who's birthday it is. Through studying Divine Principle together we all experience New Life in many ways!